In ye olden days of gantt charts they were anything but collaborative. They were usually kept and maintained by a single person, or small group of people and were incredibly difficult if not impossible to share. Now, however, gantt charts can be maintained not only by a single PM but by the entire team. 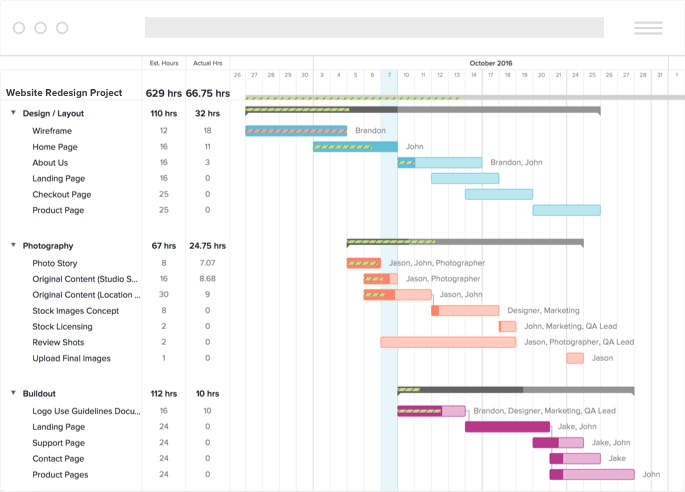 Once you’ve completely scheduled your gantt chart, it’s time to get the team in on the action. Inviting your entire team (or at least those who will be assigned tasks in the particular project) to the project allows you to be able to assign tasks to them. Each person in your project will be able to filter the chart to only show them the tasks that they are assigned. This makes it easy for them to prioritize their time because they know ahead of time what is expected of them and when it’s due. In the last section I mentioned that you or your team could drill down into the chart using filters to only see tasks that are pertinent to them. That’s not the extent of filters though. You can use filters for a variety of things. 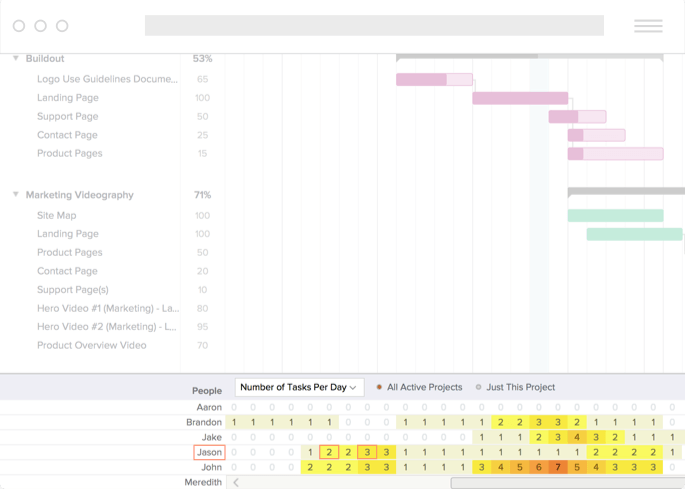 In TeamGantt, you can filter based on Person or Resource, Date, and/or Task Color. This allows you to segment your project into easy to digest chunks. It’s especially useful as your project grows and you have lots and lots of tasks spanning a long timeline. TeamGantt also offers the ability to bookmark filters for later use. This is fantastic for saving different views of your project. Think about having a view that you can show management that give them an overall picture without getting them bogged down in the details. Having a meeting with the marketing team? Filter the project down to marketing related tasks. All inside of a single main project with the click of a button. Being able to see the entire workload of your whole team is a huge benefit while you’re planning and scheduling your project. Can Ben take on any more design work right now or is his plate already pretty full? Zach looks like he’s got a pretty light workload over the next couple days. He could pick up the slack. The marketing team is pretty busy for the next 60 days so maybe now isn’t the best time to take on that new client. So on and so forth. In many PM tools the schedule and resourcing are handled in different parts of the app. This can cause a lot back and forth and be a little frustrating. In TeamGantt the Availability View allows you to see your resourcing AND project schedules in one view. This can be a big time and frustration saver. Estimating how long a task or project should take is an important skill. The estimates you make are vital to the success of your project. Estimate too much time and your project can run over budget and you may have people sitting still with not much work to do. Estimate not enough and you have a recipe for disgruntled workers who may begin to feel under the gun to get more work done than there is time in the day for. Estimating to the hour isn’t for everyone. Not all projects need this level of specific planning. It can add a level of complexity to your project that you may not need. There is a happy medium in all of this of course. You want to estimate enough time to realistically complete the tasks that need to be done while at the same time pushing the envelope a little to keep things moving along at a nice pace that makes management and clients happy. The combination of Hourly Estimating and Time Tracking in TeamGantt is a powerful set of tools to not only allow you to track the *real* amount of time your team is spending on tasks, but also help you get better at estimating for future projects. To add an estimate to a task, just enter the number of hours you think the task will take in the estimated hours column of the gantt chart. You don’t have to use whole numbers here. For 30 minutes, just use .5 hours, etc. Once you have a total number of estimated hours for the task, you can even break that down across any people or resources that are assigned to that task. For example, if you have a task that is estimated to take 10 hours over two days, TeamGantt will automatically assume that the assigned person will work on that task for 5 hours per day for the two scheduled days. If you have more than one person assigned to the tasks, you can break up the estimated hours however you like across the assigned people/resources. As any person assigned to a task with an estimate updates their percent complete, you’ll begin to see a visual representation of how on-time, ahead of, or behind schedule a task is. In the Availability view of TeamGantt, you’ll notice that you have the option to see the grid represented as number of tasks per day, or hours per day. Knowing how many tasks a person or resource is assigned is important. If Joe has 7 tasks assigned on a single day, it’s probably a safe bet the he can’t take on any more work today. Heather, on the other hand, only has 1 task assigned today. Surely she can handle this one more thing. See where this is going? What if Joe’s 7 tasks were only estimated to take 30 minutes each? That’s only 3.5 hours worth of work. Even planning some gaps in there for things to take a little longer than the estimate, it’s still probably only a half day’s worth of work. Heather on the other hand has that one task today but it’s a task that is estimated to take 8 hours. Even if things go really well, there probably isn’t enough time in the day for another assignment. This is why hourly estimating is so important. Knowing how much work people have assigned to them is crucial in making sure the workload is distributed in a way that makes sense for your team and your project. 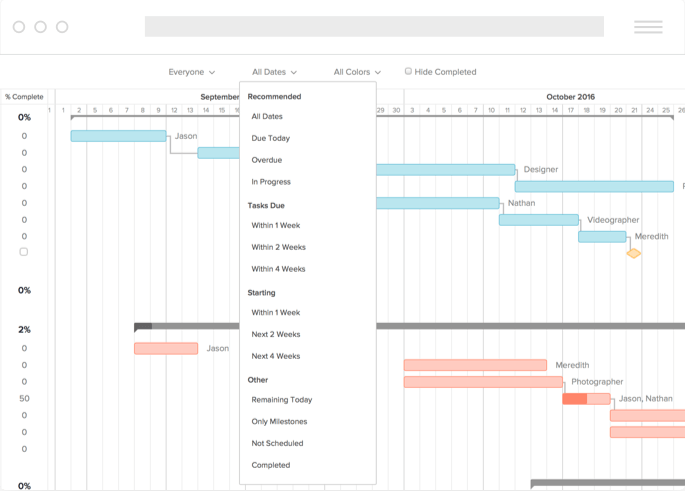 While the availability view at the bottom of each project in the gantt view will only show you people who are invited to that project, the Team Availability screen gives you a glance into the workload of everyone in your TeamGantt account. Just like the availability tab, you can view this based on Hours per Day or Number of Tasks per day, and there are a couple basic filters like “Hide Completed Tasks” and “Hide Users Without Assignments”. These filters will help you get a more accurate look at workloads across all projects. In TeamGantt, there are People and there are Resources. A person, is exactly that. An actual person that will be doing some kind of work or have some tasks in a project. Think of a resource as a group or perhaps even an external company or organization. For example, Fabrication, Database Development, QC, etc. Not many tools make a distinction between People and resources. Here’s why TeamGantt does. Resourcing in many other apps forces you to treat every person and resource as something of a nameless and faceless ‘entity’ rather than an actual person with input into the project. Because TeamGantt is so collaborative by nature, it requires that People be able to have direct input to the project and play their role in managing things. A person must be invited to the project and accept that invitation. They can then leave comments, upload files, and update their status, and optionally receive automatic daily updates of what they should be working on so that you don’t have to nag them. Resources on the other hand can be faceless groups or entities outside of your direct control. Resources don’t require an invitation, but the also have no direct input into TeamGantt. Maybe it’s a software development firm that actually builds out your apps, or a manufacturing facility that machines the parts for the free energy machine your firm is working on. These are groups that play a role in your project but that don’t need to be managed so closely by you and who don’t need to be able to add comments, upload files or update their percent complete. 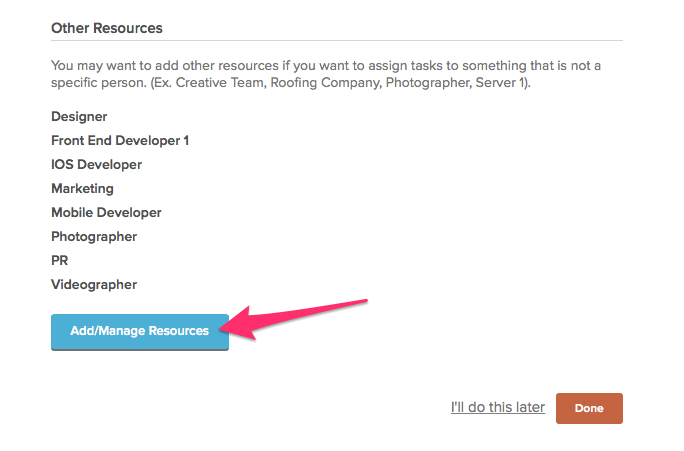 This is useful if you’re working with an outside group that has their own PM and will just be supplying you with general status updates that you can then adjust yourself on the tasks that those resources are assigned to.